I am thankful for all the silly stuff that runs around on the internet and tv. Like Honey Boo Boo. (trust me- turn it on and you can’t look away). And Grumpy Cat. I LOVE Grumpy Cat and never get tired of looking at him! 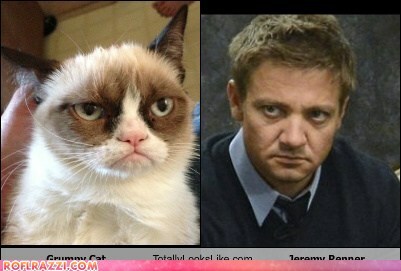 It kills me how he looks just like Jeremy Renner! And my new favorite little animal clip is the scared baby red panda. OMG she KILLS me! Click here to watch it if you haven’t seen it, or if you just need a laugh!